March is a month of taxes and warping. I hope to finish both this month. I am putting enough warp onto my sixteen harness Ashford to keep me busy all year creating a new set of beetles for my collection. I would have put on more; but that is as much as my warping board would hold. I am planning on this set of beetles to be more brilliant, more colorful,more anatomically correct and include more species from all the families in Thailand. I will be weaving four beetles at a time; each on a slightly different colored warp for a richer and more varied result. The tabby warps; those on shafts 1 and 16 for me, show more on top than those on the other shafts. Thus, the impact of the tabby warps is much greater from a color blending standpoint. The non-tabby warps are more subtle. I've varied the colors within each beetle's warp yet kept them on the dark side of value. 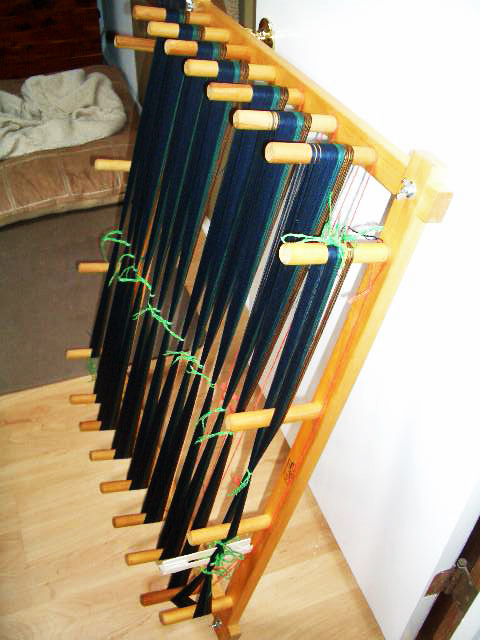 Next I will be mulling over which technique to use to roll the warp onto the loom...will I swing it over our rafters in the living room... perhaps roll it on my metal skeiner...or come up with a new way to keep the warp tight and not moving while I thread the heddles. While I mull, I work on that other project.